While bed and breakfasts are becoming a more popular option for travelers seeking unique and authentic accommodations, there’s still plenty of travelers who don’t understand what a B&B is all about. There are major differences between a B&B and a corporate chain hotel, and travelers should learn more before they decide what is right for them on their next trip. Prices are sometimes higher at B&Bs than they are at chain hotels and larger properties, but there is more value included in your stay. At a larger hotel property, there are many more rooms and significantly more guests at any given time. Generally, you don’t receive the same type of personal service that you receive at a B&B. In addition, the hotel will price everything per item. If you want WiFi in your room, that will be an extra cost. Snacks from the mini-bar are outrageously expensive. At a B&B, most of those amenities are included. 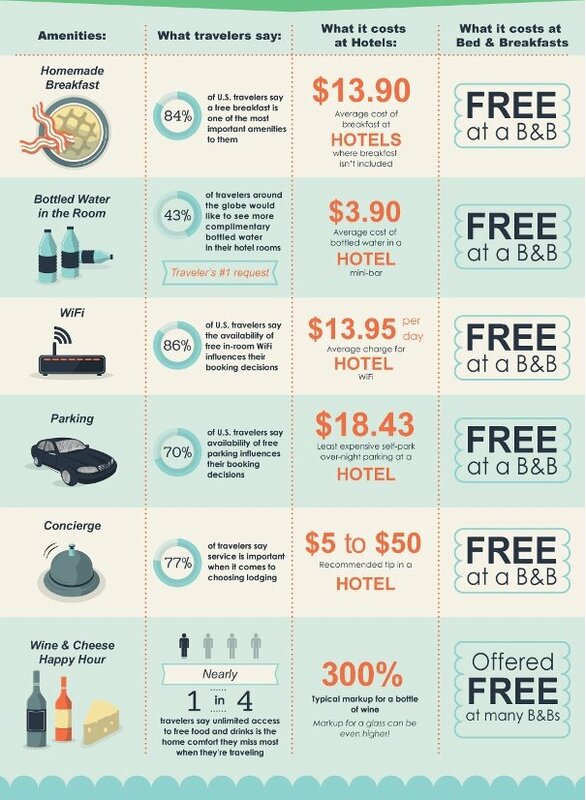 Most B&Bs offer WiFi free of charge to their guests. The innkeeper often prepares afternoon refreshments and offers wine to those who are checking in for the night. A plate of homemade cookies can sometimes be found at the front desk. Guests often can visit a library filled with DVDs, books and board games to fulfill all of their entertainment needs — at no extra cost. Make sure you use free amenities like a hearty breakfast, WiFi, and parking to play in your favor. Many people think of B&Bs as a place where couples can get away for a romantic weekend, but the reality is these small accommodations providers love to have business travelers stay at their properties. This is because business travelers are loyal, repeat guests. For business travelers, it’s often difficult to leave home in order to fulfill their professional obligations, and a B&B provides them with a home away from home. In terms of cost, business travelers will find that many B&Bs offer corporate and business travel discounts, particularly to repeat customers. Plus, they can easily ask for separate invoices if necessary to validate work expenses. The B&Bs that you book today are far different than the B&Bs of several decades ago. Most are designed for couples, recognizing that private bathrooms are a must-have for many people who are booking rooms today. Also, many properties have added extra insulation between rooms and floors to increase guest privacy during their stay. Finally, many people are worried about having to eat meals family-style with strangers. But B&Bs usually include tables and chairs within the room space for those who wish to dine alone, and there’s often dining rooms with multiple tables in the common eating area. Are you selling your packages online through an online booking engine? With one like Little Hotelier, you can easily promote your business traveler packages and upsell the relevant extras. Watch a demo to see how it works.